Late winter and early spring are a challenging time for gardeners. We’re excited to head out into the garden, but we know better than to rush the season. Going up against Mother Nature only leads to tears. So enjoy the last bit of quiet before the spring garden rush, and peruse our top 5 tips for the early-spring garden. Digging in wet (and/or frozen) soil can damage the soil structure. To be sure that your soil is ready for planting, pick up a handful and squeeze it into a ball. Now poke at it with a finger. If the soil ball crumbles, you’re good to go. If it sits in a little clay ball (or could be shaped into an ashtray), it needs more time to dry out. While early spring is a great time to prune many trees and summer-flowering shrubs, avoid taking the pruners to spring bloomers like lilac, redbud, and viburnum. These plants flower on buds they grew last year. If you prune them before they bloom, you’ll be cutting off this year’s flowers. For a list of what and what not to prune this time of year, check out our post The Kindest Cut: Pruning Shrubs in Spring. Clients are often concerned that a freeze after their daffodil or tulip foliage is up will kill the flowers. No worries! 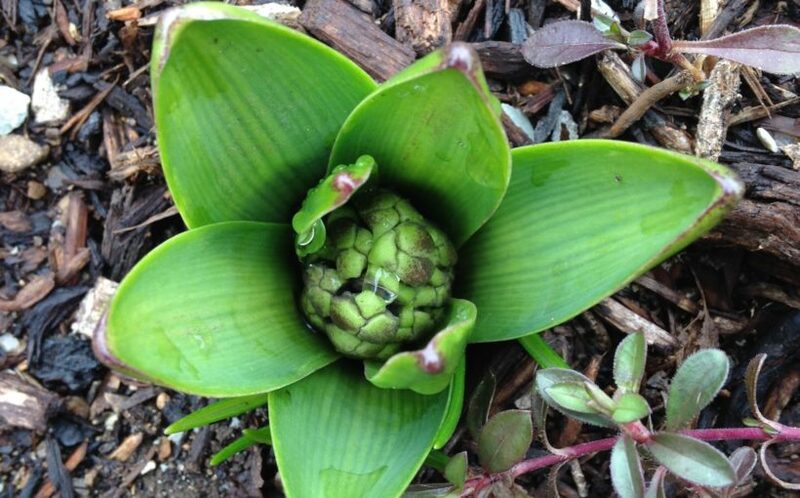 Spring-blooming bulbs have evolved to deal with the changeable early-spring weather. Even a foot of snow on top of the green stalks won’t finish them off. However, if your bulbs are blooming, a solid freeze might kill the bloom. In that case, just snap off the stem, let your bulb foliage ripen (turn brown and flop) as usual, and hope for better luck next year. Hold off on mulching until the soil has time to warm up and dry out. Mulch acts as an insulating layer over the soil; mulching over cold soil holds the cold in. Your best bet for mulching in central Indiana is after the first of May. And whatever you do, avoid the dreaded mulch volcano! Leave your lawn alone. Mowing over wet soil is likely to compact soil and pull grass blades out by their roots. Turfgrass is set to grow like crazy this time of year without any additional fertilizer. So fertilizing in early spring encourages top growth at the expense of root health and encourages weeds more than grass. The exception: you can spread corn gluten meal as a safe, organic pre-emergent herbicide. Get it down on your lawn in the next couple of weeks before the dandelions bloom.